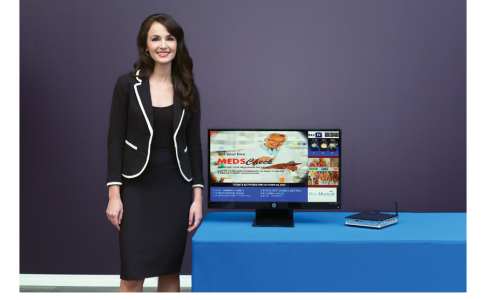 Communicate instantly with your residents on your own corporate TV channel. Rax TV is a high quality digital signage media designed and built from the audience's point-of-view. Through a single point of data entry, your community information is delivered via internet. 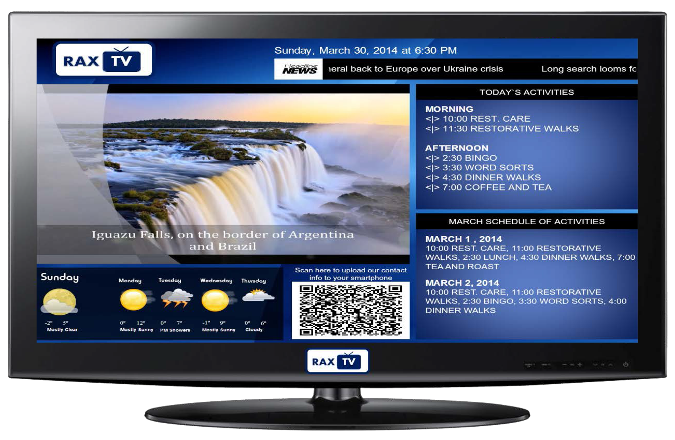 Rax TV communicate directly and instantly with your tenants or residents on your own corporate TV channel. Our channel is seamlessly integrated into your existing channel line-up and is an information resource for all of your tenants or residents. Rax TV enables you to promote daily and weekly meal menus, activities and special events, birthday and anniversary celebrations, corporate communications, up-sell opportunities, and other information that will inform, educate and motivate your audience. On-screen at all times is your company logo, local date and time, 5 days weather forecast, headline news, daily and monthly activities. On-screen template is fully customized to cater client needs. Rax TV produces and broadcasts all of your content for you with our easy 1-2 step updating process. Inquire about a free no-obligation presentation in your offices.